Directions: Grab graph paper, pencil, and straight-edge. The method of solution used in each problem is your choice. Be sure to show your work! A solution using "systems" is expected. The Have-a-Heart Shelter has 5 fewer dogs than the Long Point Shelter. 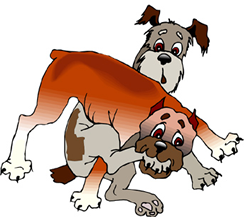 Together the shelters have 53 dogs. How many dogs are in each shelter? Set up two equations and solve them as a system. 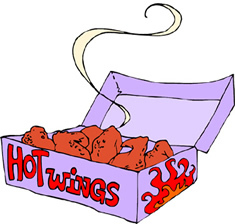 The Pizza Shop sells hot wings in two order sizes: regular order and jumbo order. Three regular orders and four jumbo orders cost $64.50. Four regular orders and three jumbo orders cost $61.50. Find the cost of one order of each order size. Homer is kayaking on the Mud River. 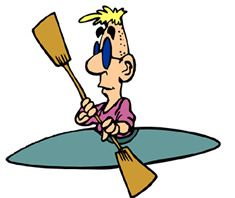 He travels at an average speed of 3.75 miles per hour when paddling with the current and 2.25 miles per hour when paddling against the current. Find the speed of the kayak when paddling in still water and the speed of the current. The Fantastic Fit Gym offers two different membership plans. Each plan includes an initial membership fee plus a monthly charge for one year. 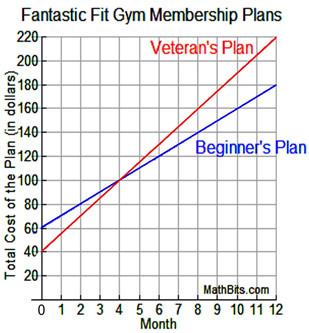 The graph at the right shows the cost of the beginner's plan and the veteran's plan, for one year. a. What is the membership fee for the beginner's plan? b. In what month is the total cost for both plans the same? c. What are the monthly charges for both plans? d. Write equations to represent both plans. A rocket is launched from the ground and follows a parabolic path represented by the equation y = -x² + 9x. At the same time, a frisbee is thrown from a window at a height of 16 feet and follows a straight path to the ground represented by y = -x + 16.
a. Graph the equations that represent the paths of the rocket and the frisbee on the same axes. b. Find the coordinates of the point(s) where the paths intersect. c. Will the rocket and the frisbee hit the ground at the same time? Explain. Kyle works part-time for a local contractor. 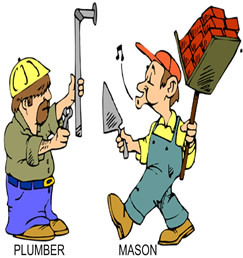 He makes $8 an hour if he works with the plumber, and $12 an hour if he works with the mason. Kyle cannot work more than 10 hours per week. Graph the two inequalities that represent how many hours Kyle needs to work at each job if he plans to earn at least $100 per week. Label the solution set with the letter S.
A skateboard company produces a wooden board and a polymer board. Surveys show that consumer demand will support the production of at least 200 wooden board and 150 polymer boards each day. Machinery limitations, however, will restrict production to no more than 300 wooden boards and 270 polymer board per day. Each wooden board yields a profit of $4, and each polymer board yields a profit of $6. The company has a contract which requires the shipping of at least 380 boards per day. Find the number of each style of board which should be made daily to maximize the profits? Northwest crows drop shellfish onto rocks from various heights to break open the shells. A crow drops a shellfish from a height of 20 feet. The function y = -16x² + 20 (where x is time in seconds) represents the distance, y, in feet, the shellfish is from the rocks. a. A nearby scavenger bird sees the shellfish dropping and attempts to grab the fish before it hits the rocks by flying along a path represented by the function y = -2x + 6. Is it possible for the scavenger bird to grab the shellfish before it hits the rocks? Explain. b. Assuming the scavenger bird does not grab the shellfish, when will the shellfish hit the rocks (to the nearest hundredth of a second)?